"Is American Samoa a country?" "It belongs to the US. It's not part of it, though. And it's on my list." "To be fair, so is Antarctica." "But American Samoa has a flag. And it means I get to eat fish. I've been missing fish." I'm not a geography major. But for the purpose of this project, American Samoa is totally a country. Largely due to the fact that I've eaten a lot of red meat lately. And I was planning to go fishing. That didn't end up happening, but by that point I had my heart set on fish. So American Samoa, it is. I'm one of those people that has countless texture phobias when it comes to food. I can't stand eating bananas or peas. I have to add enough water to smoothies to get away from that too-thick-to-be-a-drink consistency. I'm getting better though. Oysters are now a favourite which, to be fair, are right up the list of worst food textures around. Raw fish, funnily enough, I've never had an issue with. Death row meal? Fresh fish, for sure. Oka I'a is basically raw fish salad, marinated in citrus, then drowned in coconut milk. 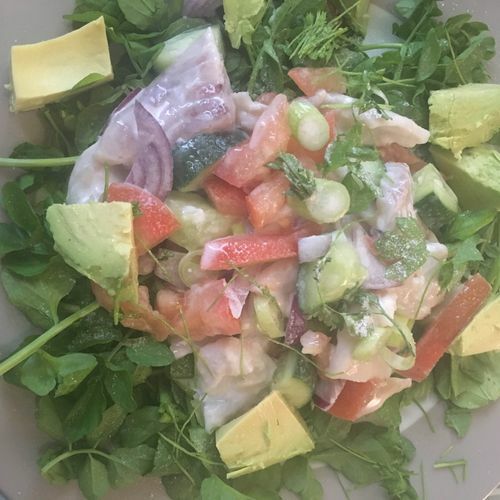 I'm a massive fan of ceviche, and when I first started re-learning to eat, it became one of my go-to safe foods. No cooking (added oils) to worry about, a bit of citrus and some salad. That's doable to someone who's trained themselves to be terrified of food. I've never tried the Polynesian version with coconut milk, however. For a long time, coconut milk wasn't something I could face. These days I love it. Yet another plus for American Samoa - I get to mix two of my favourite foods while trying something new. Any white fish will do, as long as it's fresh. 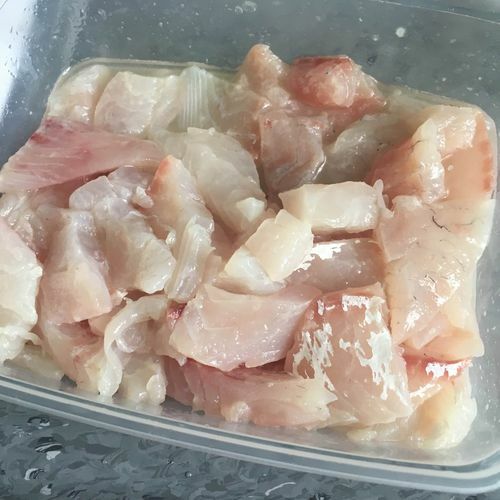 Chop and marinate in lime juice for anything between 1-100 minutes (depending entirely on how much you want the fish "cooked"). Drain and add whichever chopped raw vegetables you want (though cucumber and tomato are popular). Add tin of coconut milk. 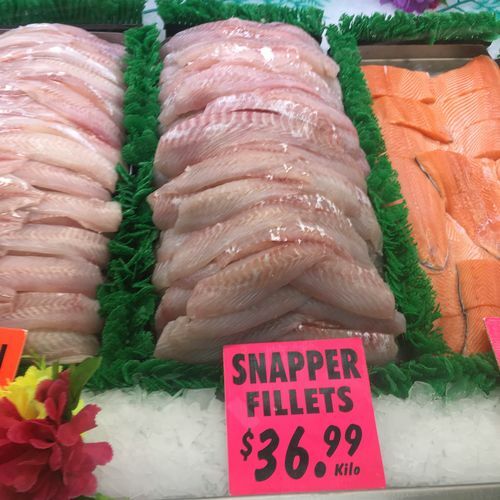 While life and tides got in the way of fishing, the woman at the local fish market promised the snapper had come in that morning. I recall an ex-boyfriend teaching me the art of picking fresh fish. The more translucent the better, Always smell it. The less *fish* smell the better. This week has also been a very anxious week food-wise. So I guess it's pretty good timing that this week's country gives me a "safe food", while still incorporating something that a couple of years ago would have been an impossible risk. Sometimes the steps forward are huge. Sometimes they're baby steps. As long as they're going in the right direction, though, right? I went basic with the veges. Cucumber, tomato and red onion went in with the chopped and marinated fish. Seasoned with a bit of salt and parsley and the result was easily my favourite so far. Creamy and fresh, with crunch of the onion and still super light. Tastes like summer. If raw fish texture freaks you out, this won't be a fun meal. But this is my new go-to combination. So is American Samoa technically a country? Based on what I've just eaten, I pretty much don't care. I'm calling it, for sure. Cooking fish with acid has never been a big thing for me; it sits in the twilight zone between raw (I like good sashimi) and cooked (grilled, panfried, steamed, it's all good). For me, ceviche, ika mata etc. rarely hit the heights of deliciousness "properly" cooked fish achieves, so I almost never cook fish with acid, though I will sometimes order it at a restaurant if it looks good as an entree. I think it's mostly to do with the texture (which I find less attractive) & the acid (which tends to drown out the flavour of the fish). I've always loved cooking fish with acid, but also found with this one, after draining the acid and drowning in coconut milk, the lime didn't really shine through much. 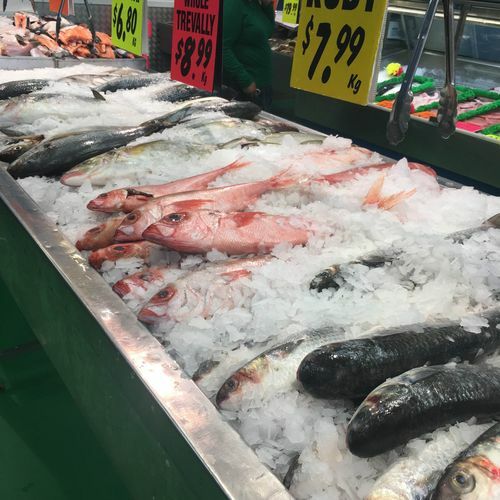 Not big on fish but can cope with it when it is battered or crumbed, So, the thought of eating raw fish fills me with horror. People used to go on about eating oysters as akin to the meaning of life; so I once tried one but it was a horrible experience--like gagging down a bad smelling snot-ball. We are visiting Samoa (Samoa Samoa) in January, so I am hoping for pork and lots of fruit. Draining the acid before eating? That's a good idea. I'll have to give it a try sometime.